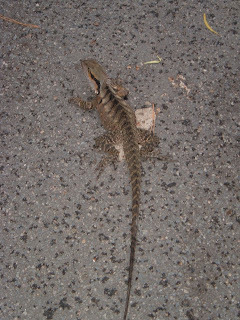 This part of Australia has some interesting local wildlife, the water dragon is no exception...it can run on water! We see the water dragons mostly at the local park pond when they are out of the water. Its easy not to see them and almost walk on them when they are on the park path. They are harmless but do give you a scare when they move suddenly when you havent seen them first. The big ones are about 1m long.